Can we use MSI mode with cluster members? i think so we dont use, the server instance in the cluster always need a updated config file. In MSI mode the NodeManager is responsible for getting the correct “config.xml” file from the AdminServer. If the AdminServer is not running then the NodeManager will start the ManagedServers using “msi-config.xml” file. “msi-config.xml” is a configuration file which has the Last running configuration file of the Domain. * Ensure that CrashRecoveryEnabled is set to true. * You should start the Administration Server via Node Manager. * All managed servers should be started via the Administration Server. You can accomplish this via WLST or the Administration Console. I am starting the Managed server from admin console using node manager and it generates “.out” and “.log” files in Server Log directory . We can limit the size of “.log” file from admin console and it rotates after that specified size. Can we do similar configuration for “.out” file ? What i have observed that this file rotate only on Server start . Thus what is happening once “.out” file reach 2Gb , the WL is not writing any logs to it and moreover opening the 2GB in memory is also useless. Please read the comments also mentioned in the above link to get more informations of Rotating STDOUT…issues. 1) I enabling this option from Admin console. will it possible for u to come online? I m online right now. I did one more thing. I keep the severity level to level of warning for std out and thereby logs ( notice and info) are not going to std out and they are redirecting to log file. What is your Opinion on this? Is it a good way ? Problem is, in the entire duration of the JVM life, only 2 nodes will be hit; could be node3 or node1; or node1 or node2; but never all 4 of them; the volume of different users is a lot; this is production live; I saw from proxy logs that it’s only picking one preferred server in iplanet1 and the same thing with iplanet2 so all in all, there are only 2 nodes being hit; ANY INPUT? Thanks! Pls help me out the Node manager is starting …but when i sarts the Admin server the Node manger is forcely getting shutdown…. Looks like Port is already in use. Please kill the Port and then restart your processes. Still if it doesnt work then It means there must be something wrong with the configuration. So can i change to other port…. i have tried after changing the port…. bt no use now it is showing javaIO Exception…….. I have a doubt that i made all the servers down including Admin. I m trying to start the Node mmanager and then i m trying to start the Admin…. Is your NodeManager coming up properly ? It would be better if you can paste the Exception Trace which u are getting in the logs…IOException or anything else. While Posting the comments Please replace all > characters with &gt; and Similarly replace all the < characters with &lt; Otherwise your Errors may not be visible in the comments. Yesterday in production environment i have comes across an strange issue. We are seeing that managed sever is running and it is starting one more instance of itself. The second process is transient. It comes and goes and thus causing memory exhaustion. anp 12192 26161 0 Oct 02 ? 7790:16 /opt/fsm/bea/jdk150_12/bin/java -Dweblogic.Name=ANP-lenxksfsmanp01m-8011 -Dbea. anp 5341 19046 0 16:25:56 ? 0:01 /opt/fsm/bea/jdk150_12/bin/java -Dweblogic.Name=ANP-lenxksfsmanp01m-8001 -Dbea. anp 19046 26161 0 06:30:25 ? 1075:00 /opt/fsm/bea/jdk150_12/bin/java -Dweblogic.Name=ANP-lenxksfsmanp01m-8001 -Dbea. PID 5341 which has a PPID of 19046 appears to be the managed server trying restart itself. Let me know if u have come across this isssue? The problem here is our “.out” file has reached to its max limit and thus nothing goes there. There is nothing in server log file. So we dont have logs . The node manager is not playing any role here that is confirmed from logs of node manager. I just don’t know how to reproduce this. Any way we are planning to raise SR on oracle for this and update here on this. i have created a horizontal cluster in two physcal boxes. BEA-310006 Critical Subsystem Cluster has failed. Setting server state to FAILED. As the Error / Exception which u pasted are not clear/visible …we are not able to understand the actual issue. Please read the Point4). from the following link: http://middlewaremagic.com/weblogic/?page_id=146. BEA-000114 Failed to find cluster license: Error: Can not find component Cluster for WebLogic Platform 9.2 in the license file. BEA-000362 Server failed. Reason: Error: Can not find component Cluster for WebLogic Platform 9.2 in the license file. The above errors in Server Log indicate that eidht er you dont have a valid “license.bea” file or it got corrupted or wrongly edited by someone. Please contact Oracle WebLogic Support Team or your WebLogic Sales Representative person to get the correct license file. Description:Failed to find cluster license: message in the license file. Cause:You need a valid license file to run clusters. Action:Contact your sales representative for a valid license. ” <TCP/IP socket failure occurred while fetching statedump over HTTP". I see this is related to addressing. Now, we do have a different cluster in the same domain with the same multicast address and diff port. Do you think that might be the cause? Lately I am facing many issues with multicast addressing, is there anything particular problem/advantage using Unicast? I have a cluster with two managed servers, on diff boxes, I think Unicast might be the better option. Thoughts? PS Relieved on finding the site again! left the part : <TCP/IP socket failure occurred while fetching statedump over HTTP"
1). There is a very high probability of multicast storm in the network..which usually leads to Bad N/W performance. 2). For every clusters Cluster Master the headache will increase. Every Cluster Master has to validate the incoming multicast message is coming from the correct Member of the Cluster or not. The Validation causes additional performance degrade. 3). You will start seeing Many Side effects of using same Multicast Address….like “TCP/IP socket failure occurred while fetching statedump over HTT” …etc. Unicast Messaging creates very less burden on the network compared to the Multicast. In Case of Multicast Communication Evey cluster Member sends a small Multicast message to all the other members of the Cluster. But in case of Unicast the complete cluster is divided into multiple groups and Nodes only sends the Unicast messages to their Group Leader only. Group leader is chosen by automatically by the WLS APi…Usually the Older member of the a group becomes the Group leader. If the Gropu Leader goes down/crashes automatically the next older member Server of that group becomes the Gropu Leader. Unicast Clustering promise little better performance compared to Multicast. Thats why from WLS10 onwards WebLogic Clusters “Messaging Type” is Unicast. Earlier versions of WebLogic used to suppoort only the Multicast. WebLogic Server provides two versions of Node Manager. The Java based Node Manager used in windows system. The script base Node Manager is used in UNIX or LINUX system. The script based Node Manager are using the SSH client. The main advantages in the script based Node Manager is “Automatic Server Migration” is available in the Script based Node Managed not available in the Java based Node manager. How to configure the Script based Node manager in LINUX system? I have configured the Script Based Node manager in Linux Environment. But in the Script based nodemanager this page not referred by the nodemanged,then how to increase the heap size for every managed server in the Domain. The nodemanager.properties file is not available in the script based nodemanager. But in the Java Based nodemanager the nodemanager.properties is available in the nodemanager home path. The script based nodemanger the only file is available is nodemanager.domains. i have one idea but if you change the setDomainEnv.sh shell script have the heap size 256mb & 512mb. If i changed into 1024mb means then all the managed server heap size max & mix = 1024mb. But my requirement is this first managed server have 1024mb and the second managed server have 2048mb. I have already post my comments in James Bayer’s Blog but He said i am not configure the script based node manager. I only configure the java based nodemanager. The MS1 max & min heap size is 1024. The MS2 max & min heap size is 2048. I have configured the Script Based node manager through admin console i start the remote managed servers MS1 , MS2. We create Two unix machine Unix1 , Unix1. Unix1 –> assign servers Adminserver , MS1. Unix2 –> assing server MS2. The Two manager servers (MS1,MS2) is configured with Cluster (CLUST). If i configure the Whole server migration option in the weblogic admin console. I am unable to start Two managed servers. I mentioned the errors are below. How to resolve this issue during the Whole server migration by using the Script Based Node Manager in the cluster environment. I have post my error logs my i checked double time all the data is available in the ” Leave Comment ” box but if i post the comment last 34 lines missed in the each managed server error logs. Kindly remove my last post. [WARN ] Use of -Djrockit.optfile is deprecated and discouraged. How to resolve the problem during the Script based node manager during the Whole Server Migration in Clustered Environment(CLUST). I resolved that issue.In my configuration nodemanager.properties file is not available because i am using the script base node manager. The nodemanager.properties is available in the Jave based node manager. The error main reason is i am not mentioned the ip address for cluster. The log error message shows the cluster ip address is Null. Then i configured the ip address to cluster then the problem is resolved. Thank you for sharing your Finding and the Resolution of the issue with us…. Magic Team Shares 15-Bonus Magic Points for you. Is there an effective way to achieve load balancing in weblogic 9.2.2.0 server or weblogic 10.3.0 server without any physical switches or network load balancers. Can we use cluster technology for this ? if so, can you give me some idea or some process that explains this ??? Load Balancing Without having a Cluster can be achieved with a Proxy Server like Apache Proxy. will creating a cluster allow load balancing ??? isn’t there anything else that we need to do ??? I am sorry but can you please explain a little as how the post does load balancing ??? Yes, there are few cluster algorithms which can be used depending on the environment requirement, just have a look at the below comment which might help you understand the concept. Proxy Plugin doesn’t have any additional parameter to specify Load Balancing (Round Robin) among Non-Clustered Managed Servers. You can use the WebLogic HttpClusterServlet ProxyServer, however you have to make sure that the managed server which is hosting the ProxyWebApp application should not go down or else your your Proxy Server would go down. I have configured a singleton service using the steps outlined on this website. The singleton service migrates successfully if the managed server is brought down via Node Manager. Whenever the Node Manager is brought down abruptly, however, it cannot recover. If I restart it, the server’s state it is managing is UNKNOWN. If the Singleton tries to migrate in this state, the servers sometimes are marked as FAILED. When X is rebooted, the singleton migrates to MS2. When Y is rebooted, MS1 enters the Failed state. For Singleton Service migration it is must that you use NodeManager and this migration happens by the NodeManager. So Killing the NodeManager is not recommended. Also Whenever you want to start your Managed Server which is part of Cluster and Holding the Singleton Service….Must be started using NodeManager Only. If you dont start a Managed Server with the Help of Nodemanager then Nodemanager will always get the State of that Server as “UNKNOWN”…Nodemanager can get the correct health State of a ManagedServer only when the Managed Server is started with the help opf NodeManager. Hello Ravish, thanks for the input. Also one last question ??? Is the HttpClusterServet method for load balancing more effective or using an IIS plugin for load balancing more effective for production environment ??? It totally depends on your business requirement and Business budget to choose what kind of Web proxy should be used. As you mentioned that you are using Windows2K3 which provides IIS by default so it will be a best option to go with IIS. Due to the space there we are not able to see any of your Exceptions. WLS Kernel>> <1292921644783> <BEA-310006> <Critical Subsystem DatabaseLessLeasing has failed. Setting server state to FAILED. If before the Error code “BEA-310006” somewhere above in the server log if you will see then definitely you will find sone Multicast related Messages or Some Network related Error Messages / Warnings. Usually above kind of issues happens due to n/w issues. As soon as you see such issue better try applying the multicast test or Check with the N/W Team…95% cases you will see it’s due to Multicase message Broadcasting failure or N/W Issue. And regarding ” java.lang.UnsatisfiedLinkError: no stackdump in java.library.path”…you need to check whether the “-Djava.library.path” System variable is set correctly or not….For different operating system has different Environment variables like SHLIB_PATH, LD_LIBRARY_PATH etc…so you need to check whether those are pointing to the correct Native Library Modules or not? The only error above 310006 is this. Note that cfwpoint51 is the OTHER server whose nodemanager was just killed. Also, why would it say DatabaseLessLeasing has failed – I am using using consensus leasing, not database leasing. I suspect that your “config.xml” and “xxx_DataSource_jdbc.xml” files might be configured to use Database Leasing. Or can you please post the complete Stack Trace where it says DataBaseLeasing has Failed…. May be few lines above to that error we can find something related to it? I enabled the the Administration port and by default it runs on 9002. However we have already a different weblogic admin application running on 9002 port . So i was redirected to this application admin console. Thus to come out of this i had to stop the weblogic running on 9002. Put your desired Port number there and then start your AdminServer. Is there any limitation using clustered architecture for weblogic. In our architecture, we have clustered environment and weblogic 10.3.0 is our app server. When we create concurrent instances (say 500-600), instance creation stops after 200. Is this because of the cluster configuration??? Is there anyway to find the cause why the instance creation fails? anything to check from weblogic side? From WebLogic side there is no restriction on the Number of Members for a Cluster…So as far as your Hardware/Network supports You can add as many Members to the Cluster. But please remember that as soon as you increase the Number of nodes in a cluster …after a certain number (based on your N/W and Hardware combinations) the performance of overall Cluster starts decreasing…Because Every Cluster Member has to send some Heart Beat messages to other running members of the Cluster, The Cluster Master has to maintain the ActiveServerList (Dynamic Server List), Maintenance of Session Stickyness ….etc are various factors which creates an over burden on the Network because usually in Clusters the cluster members communicates with each other using some Multicast messages which creates a Multicast storm on the Network as soon as we keep on adding many cluster Members to the Cluster…. to have connectivity to every other cluster member, WebLogic Server uses a group leader strategy whereby the oldest member of the group (in other words, the server that was started first) is designated the group leader. All members of the cluster connect to the group leader so that the group leader acts as the relay point for cluster messages between members. If the group leader goes down, the next oldest member becomes the new group leader. of hops that a cluster message must traverse to reach all cluster members. environment with your applications under realistic loads to ensure that you system behaves as expected. This is especially important for large, high volume systems. Is group leader is different than cluster master? It is good to know that there is a concept of group leader for 10 members. Can you please let me know some document where i can read more on these concept? Now i have configure the cross domain user configuration in the oracle weblogic 10.3.3 server. But i am not able to configure. I have mentioned the below oracle document to configure the cross domain configuration. Can you explain me the use of Data folder under AdminServer/managed server? I tried starting admin server in production mode and it was giving me an exception that in production mode, password encrypted field cannot have clear text value (java.lang.illegalArgumentException). When i saw the config file, for Admin Server, I was not able to find the tag. Can you let me know if this is fine? I tried adding this tag manually to the config file with the password encrypted as node manager password. Still i was getting the same error. Step3). Now Start your Server. To see everything is OK or not. Step4). Now before changing your Server to PRODUCTION MODE back…. please use the following command to Encrypt the ClearText Passwords ..
Step6). Now Enable the PRODUCTION_MODE=true and then start your Server. NOTE: Before making any changes to “config.xml” please take a Backup of it. Thanks for your prompt reply. I have a boot.properties file in the data-> node manager folder. This is what I tried before your post. I changed in config.xml to false. I restarted the server and everything was working fine. Am not sure from where it is complaining of clear text passwords. Can you let me know from where it would be looking?? After starting server in dev mode, I encrypted the clear text password in test server and added the tags and tag in admin server and restarted adminserver.Still it was throwing the same error. Can u please paste the error stack Trace that will give us much idea what is actually happening at your end. I have found one more thing. If i set production mode to true in config.xml then am unable to start Admin server. If I set SET production mode = true in setDomainEnv.cmd, adminServer.out file shows WLS Start Mode = Production, but the config.xml still shows production mode is disabled (I checked in console too, the production mode checkbox was not selected). Run the “setDomainEnv.sh” in the command Shell. Run the following command to encrypt the DataBase Password of the DataSource. The environment is weblogic 9.2.2 production environment in windows 2k3. I was trying to create a cluster with 2 managed servers in a domain. The same thing happens for server 2 too. when i did the same thing in weblogic 10.3, i got the same error. But i changed the messaging mode from multicast to unicast in weblogic 10.3 and then the cluster worked fine. I searched for unicast in 9.2 but seems like unicast in available only from 10.0. In weblogic 9.2, i tried with different multicast addresses and ports, still the same error, the managed servers works fine for 5 to 10 seconds and then they show FAILED state in the console. I saw a few dforums in google, and some people say its a network issue or something. can you please tell me how to solve this issue, its really been bugging me from long time. The error codes clearly indicates that you network has some issues in few nodes. Please consult with your N/W team to find out why the Multicast communication is not happening properly between nodes.. From your side you can max perform the MulticastTest to prove that there is a Multicast issue, rest your N/W team need to fix. We are connecting Oracle BPM and weblogic 10.3.0. When we execute a batch file for creating 600 records, the transaction fails. I have increased my JTA Time out from 1800 – 3600. Is this correct to increase to such a high numbmer as against the default 30 seconds. I have sent the thread dump yesterday. Please advice. Can you let us know where did you sent your thread dump? I sent the threadDump to contact@middlewaremagic.com on 2/10/2011.Please advice if I should send it again. There is a thread stuck from the beginning of the task. Initially my JTA time out was 1800 seconds. I increased JTA timeout to 5400 seconds and now users are able to make 570 transactions. The thread stuck is still there. I dont know how to find where it is stuck. Also please advise me if in future the users want to make more transations i think I need to increase JTA time out again. I think this is not the best solution. Please advice me on optimum value of JTA and why am able to make 200 transactions only when my JTA is 1800 and why am able to make 570 transactions after i increased my JTA. For some reason we dint get the file, so it would be better if you send it once again. I have resent the thread dumps. Please have a look at them and help clarify my doubt. Sorry to say but still we dint received any thread dumps. Make sure you are send it to “contact@middlewaremagic.com” and what is the size of the dumps. The size of the dumps is less than 1MB together. But still I have split up the files and sent you. Can you please give me any other alternative Id(gmail or yahoo)?? I sent to contact@middlewaremagic.com only. Sorry for the late reply was very busy from last few days. Yes, we had got your thread dumps and have gone through it. However in the thread dump it looks that everything is fine, now that be possible because you might have not taken the thread dump during the issue occurred or have taken the thread dump of a wrong server. 1) Try to enhance the batch code so that it completes the process within the 600 secs. 2) Or else if the batch cannot be enhance the code and it would take more then 600 secs then you would have to increase the StuckThreadMaxTime value as its an requirement of your application. To increase the “StuckThreadMaxTime” you can go to the following path of console and do it. Note: You have to restart the same server to take the value which has been changed. As im new with weblogic,was trying clustering in weblogic. Now i created a cluster of Managed server 1 and 2. Now wen i try to access the application from cluster ip address 1.1.1.1:7005.failed in accessing.But when i try to access individual managed server deployment.Its workin fine. To test a cluster configuration you do not have to use the IP and Port address of multicast / Unicast address as they are only used for internal communication for the managed servers. Thanks for those useful documents will try HttpClusterServlet ProxyServer. Can you pls help me in this. Whenever we create a Machine we must provide the IP Address for the NodeManager where we want to run it. The IP Address Must be correct and Valid. Please check that your NodeManager IP Address is correct or not? Thank you for your thread dump analysis. I tried increasing the StuckThread Timeout but still the execution stopped in the middle. When I increased JTA timeout to 5400 seconds then the execution was completed without any problem. Is it right to increase JTA timeout like this as this is domain level change? also the execution of the particular module takes 1 and a half hours for completing. If in future the completion takes more time again should i increase JTA time out??? is this the correct approach?? So you will need to check with your Developers to add the appropriate timeout for the application components in the application deployment descriptors. how to set the transaction timeout at application level? Is it possible to set the transaction time out for the particular cluster alone where the application is deployed? Cluster is a “Logical Unit”..It is just a logical grouping of WebLogic Servers so it does not have any timeout parameter/attribute. transaction-timeout : The child element of the element specifies a timeout value for the current transaction, if the Web Service operation(s) are running as part of a transaction. So please consult with your application developers to know what kind of timeout then need to set because it depends on the nature of the application. I will check with application team for this. 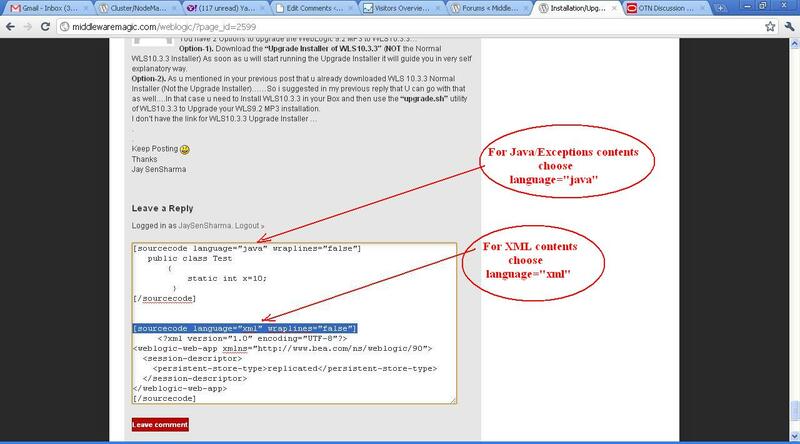 Where can i find this weblogic-ejb-jar.xml and weblogic-webserivces.xml? Can you share your suggestion on JTA timeout value of 6000? Is it good,bad?? if there are negative impacts what would they be? how to check whether other applications or affected or not? Is it like even if the transaction has completed within 1800 seconds since we have increased to 6000 the thread will still hold the connection something like that?? What is the best or optimum value for JTA? “timeout” value should be set according to the requirement. Because if the timeout value is set to very low then most of the valid transactions also will fail due to transaction timeout. If the timeout value is set to too high then invalid transactions also will wait until the timeout will not occur which will consume WebLogic Threads to be stuck in processing a Transaction…And these threads will be dedtcately working on those bad transactions until the Transaction will timeout …So like this it will consume server resources for a longer period unnecessarily. So the exact value (approximate) of transaction timeout need to be set or else it will be harmful. We have set the JTA time out value to 2000 in environment1 with same configuration but using WLS 9.2 and only one cluster. we have environment 2 using WLS 10.3.0 and 6 clusters..
Can you help me understand this behaviour? Is there anything I need to look into? It looks like this issue need to be investigated in depth, So we would request you to please open a Support Ticket with Oracle. Because if changing is making much difference in Transaction Timeout and XAConnection Factory error then it is bad. Oracle WebLogic Support person can check and compare the WLS9.2 and WLS10.3.0 codes to find out what is actually casing the issue or may provide you some debug patch to get more informations regarding the issue. What is the difference between Dynamic and Static Cluster? From the plugin side when “DynamicServerList” set to OFF, the plug-in ignores the dynamic cluster list used for load balancing requests from the plug-in and only uses the static list specified with the “WebLogicCluster” parameter, this is the called as Static Cluster. When “DynamicServerList” set to ON (i.e. default) then the plug-in would take the dynamic cluster list for load balancing the requests, this is called as Dynamic Cluster. And if you your question was not from the plugin side, then can you let us know where did you get/read about these terminology, as till now I have never heard these type of cluster. I was going through documentation on Websphere application server, where the concept of dynamic Cluster and Static cluster is dicussed.. So was looking out if there is something of similar kind in Weblogic..
Terminologies and Container Vendor specific Features offered by every application server are little different so of them can be compared and some not. Say I have a clustered environment plugged with IPlanet. Cluster is configured for Round robin algorithm. When monitored using a HP Probe..
Can you please explain how to stop Nodemanager using WLST command. I am using startNodeManager() to start the nodemanager, but no method to stop it. Please help me. Thanks. Yes, you are right there is no method to stop Nodemanager using WLST, hence you cannot do it. You would have to explicitly find the PID of Nodemanager and kill it. Also if you have noticed that there is no shutdown script for Nodemanager given by Oracle Weblogic. We are seeing huge Cluster logging information in .out files. So we want to disable the Cluster Logging option. We disbled cluster logging option from WL Admin conole –>server–> Debug. But still the cluster logs are floating into the .out file. This is real urgency for us.Hence Please take a quick look and reply me by the earliest. I am using custom identity and custom trust in my application. ofcourse both are loading in node manager and admin server. However I was the below messages/errors in admin and nodemanager log files. I have also passed ssl arguments for admin and node manager such as hostname verification and enfore. Still I am getting the Bad certificate error in node manager log file. Please help me on this. Thanks. We are upgrade the weblogic server 8.1 to 10.3.3 with Horizontal cluster domain. We have deploy the existing deployed 8.1 application into 10.3.3 weblogic server domain. then The applications are deployed successfully. But If i am accessing the application to enter the username & password then press enter key the same page will appear. Then if i shutdown any one managed server in the clustered environment then we have to access the application the application working properly. Which type of nodemanager is more feasible ? Java Based Node manager or Shell Based Node Manager . Just a back ground for the question . Issue – Managed Servers re-start on their own. Cause – Failed to renew lease with the Cluster Leader. Support team suggested to migrate from our existing shell based node manager to java based node manager . Is this a feasible option ? However I dint understand your issue, let me know if my understanding is correct regarding your issue. Thanks Ravish for the explanation . Can you let me know how do I migrate from script based node manager to java based node manager ? If you have any document or detailed steps will be really helpful . We have a cluster of 16 managed server’s. Currently for load balancing we have configured weblogic HTTPCluster load balancer, but some Apache and other can also be used. Could you please suggest which load balancing method is considered best performance wise. And from weblogic console also we have changed the listen address to this static IP and restarted the ohs,form, report server. I have a requirement to delete a managed server, say ‘server1’ from a domain. The managed server is part of a cluster, ‘cluster1’. So before deleting the managed server, I need to unassign the server from the cluster. While executing the above commands, I do not get any exception. But when I login to the console, I can see that ‘server1’ is still assigned to the cluster ‘cluster1’). Is there any other step that I may be missing out to complete this process of unassignment? and then saving the changes. This command is able to successfully unassign server1 from cluster1. Please suggest which is the correct way for unassignment. After performing these commands you can check the config.xml file. Here is indeed shows that the server is no longer part of the cluster, which is also reflected in the Admin console, after you restart the admin server. java weblogic.Deployer -url t3://IP:7001 -username xxxxx -password xxxxx -name myEnterpriseApp -targets /mywebmodule@myCluster -deploy -source . -source . -pointing to the current directory because i’ve explodeded the .ear archive and myweb.war is a part of myEnterpriseApp. But i could not figure at why it tries to deploy whole application? I’ll be so glad to hear if any one of you had a similar experience while deploying applications using command-line reference. I have two HP server with 32Gb RAM, run on RHEL 5.x. At this moment, I run a cluster with 2 managed servers and face to low HA. The available physical resource is big, so I want to add managed server to cluster. How to determine number of managed server in cluster that can improve HA of system? I am having a serious problem with weblogic and unable to reproduce. It started with our operation team reported that weblogic ejb failover is not working. I tried to investigate with config files for settings but seems it did not help. I did not put proxy-plugin inbetween here as i want to create production env. in test there are two threads calling ejb with gap of 40 sec. request gets hang for about 5 min to take failover. second thread call goes fine after 40 second to machine2 and all its method invoked on same machine. We are using weblogic 11g(OCCAS) on linux machine. Its in cluster ,application gets deployed through the admin server on engines. We are using APACHE CXF for the REST based request processing in the application. If we stop and then start the deployed application from the console, It shows active on the Page.Now if we hit the REST web service using REST client it gives 500 -internal server error. But only the POST REST requests are giving this error however the GET requests works fine.But if we wait for some time(ranging from 15 sec to 12 min) the POST request also start responding successfully. The application is deployed in a cluster ,we have noted this issue on the Envoirnments where the admin-server is on another machine and the engines are on differnet machines.Its works fine on the ENV where the both the admin server and engine are on the same machine. We have enabled the CXF logging as well but have not been able to notice any exception/error in the logs. org.apache.cxf.interceptor.Fault: argument type mismatch while invoking public com.nsn.see.application.callerid.Registration com.nsn.see.application.callerid.CallerIdService.registration(com.nsn.see.application.callerid.Register) with params [com.nsn.see.application.callerid.Register@1d03015d]. I can share the detailed logs if required as well. One more query I would like to ask.I have enabled the class loaders logging in Weblogic11g.Bu ti am not sure where i can see the logs for the same.I have seen the server log files as well as the engine log files but couldn’t locate.Can anyone help. 1> The application starts working after some time. 2> The issue comes up only when the admin server and engines are on different machines. I tried one thing which worked was I packaged the CXF.jar into the EAR itself and set prefer-web-inf-classes Element.Then the application started behaving perfectly fine.SO by this its seems that the server is not able to initialize the CXF properly.This seems to be an issue with class loading . Either the CXF jar is tried to beloaded from Admin first and then from local lib.. I tried enabling the class loader logs but couldn’t locate the logs i.e where the logs are getting added. I am using clusters in my environment which spans across 2 different servers. However, when I deploy my application it throw intermittent classcastException which I feel is because of marshalling and unmarshalling of objects within clusters (Managed server). If I shutdown one managed server, I dont encounter this issue. I have enabled round-robin affinity as well to the load balancer. Can you kindly help? Thanks for the link. Can you also help me understand how round-robin affinity affects CPU and server resource utilization? Will this cause the requests to be routed to one node only? Can some one help me over monitoring jvm utilization over 100 weblogic instances over windows.how can we monitor the jvm ?Is there any open source tool available for this?Is there any script available? I’m setting up WebLogic cluster (horizontal with 2 managed servers spanning across 2 machines).I would want to have admin server on each machine and only one admin server will be active and the other will be in passive mode.Can you please explain how I can set this up with 2 adminsitration servers and how do I make it active-passive mode for admin server and how i can bring it up in case of 1st admin server going down. Please help as I have to implement this in a production environment in a week. If i configure the Java based node manager. If i need add some application jar files in the weblogic CLASSPATH and also in need alter the JVM heap size and also i need to update the latest Jrockit JVM. If i tried in weblogic server admin console “serverstart” column. But i see the managed server has taken only the default heap size like 512MB and also the application JAR files are not added the weblogic classpath. How to alter the heap size in admin console and how to add the application jar files in the weblogic classpath and how to modify the latest Jrocket JVM in the admin console. values are not taken during the weblogic startup. Could you please provide the solution to resolve the issue. I have update the heap size in the setDomainEnv.sh it’s not taken during the weblogic starup. Then i have tried to update the heap size in commEnv.sh then the weblogic server has taken the updated heap size and also use the lastest Jrockit JVM during the weblogic starup by using the Java Based Nodemanager. If i update the heap size in the setDomainEnv.sh script for Adminserver only. I need update the heap size for all managed servers. In our environment we have four managed servers. Then we need to create five setDomainEnv.sh script or we have to add the corresponding managed servers name in the setDomainEnv.sh script. Which method we have to use in our environment. but if they are all different you have to code it as in your example above. We are having a Clustered production environment. We are following a method for restarting the managed server as first to disable the FrontEndHTTP configured in channels, then we will go for a restart. Once the server turns back we will enable it, hence it will start serving the request. My question is : Is we need to disable all the time or if we go for a direct restart w/o disabling FrontendHTTP it will behave normally when turns into running? Also i want to know about the heart beats how it is working internally in clustered env. I have a workspace with 3 nodes( in(3 servers)and engine with 2 nodes)in 2 servers). will there be any time lag for the workspace nodes to update the details from engine since its residing in another server where there is no direct connection to engine? javax.net.ssl.SSLKeyException: [Security:090482]BAD_CERTIFICATE alert was received from hwvalad2021 – 172.21.80.118. Check the peer to determine why it rejected the certificate chain (trusted CA configuration, hostname verification). SSL debug tracing may be required to determine the exact reason the certificate was rejected. The AdminServer on port 7001 is working correctly, but the newly created AdminServer in the new domain on port 7006 gives the error. Please assist. Frequently the managed server is goes down in production environment. We didn’t find any memory releated issue and stuck thread issue. We have configured the single sign on configuration in weblogic server by using SAML. This weblogic domain have only one managed server. We didn’t configure the node manager in the domain. How to resolve the issue for frequently restarting the Production managed server. If the Production managed server goes UNKNOWN then we have found the error message in nohup.out file. java: res_query.c:251: __libc_res_nquery: Assertion `hp != hp2′ failed. The above error message is related with OS Level? I have find the solution for frequently restart managed server issue in production Environment. The issue is related with glibc DNS package issue in Suse Linux OS 11SP1. Can i have 2 apps deployed on a single cluster, any security or session replication issues? Or is it recommended to have 2 apps on 2 different clusters ? what are the pros n cons. Please suggest. Im using just the jdbc service for these apps. Is it possible to setup a cluster of two managed server where each managed server resides in different subnet. I’ll use the unicast messaging model for communication. Actually I like to have one managed server in primary DC and the other in DR DC. Both will be up and running and serving the requests as usual. The advantage of having this is that my MS1 will be DR for MS2 and vice versa. Could you please let me know is it recommended and can it be done. can some one suggest on this please?